Metal appliqués provide a look of handcrafted genius. This addition to any book cover adds to its value and elegance. The luster and levels of depth offered by debossed metal appliqués is unimaginable. 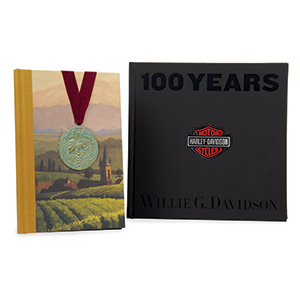 This beautiful addition to a book makes them intriguing while adding to the value of your brand. This small detail can do wonders for a company image. Metal appliqués add sheen and texture to the book. They are used to highlight specific text or images. We at Ad Industries provide a variety of metallic color options. The metal appliqué can be debossed with a wide variety of designs. We have the capabilities of debossing your company logo or name on to the metal appliqué. We utilize single and multi-level debossing processes, which provide such depth, that the design can be seen and felt with amazing clarity. The excellent material used by us makes them long lasting. The metal appliqués don’t tarnish easily and require virtually no maintenance. You can utilize metal appliqués alone or opt for a combination of onlays, leather corners, moiré endsheets, and others. The array of services offered by us is unrivaled. We provide all kinds of binding, printing, and packaging solutions. This allows you to get all your services under one roof. The umbrella of services and products offered by us makes us the preferred partner for most companies, individuals, and suppliers. To place an order or request more information, please contact Ad Industries at 818-765-4200 / 800-233-4201 or email at sales@adind.com. Since 1956 Ad Industries has been a leader in innovative turnkey print, packaging and design. © 2019 Ad Industries. All Rights Reserved.